[2015.12.11]奢侈品 - 中国 - ECO中文网 - Powered by Discuz! 2 In the neighbouring province of Guangdong, Lin Gongxi has been carving jade for 50 years in Jieyang, China’s jade capital.When business was good, he told Southern Metropolis Daily, he used to go to bed at 2am and get up at 6am. Now he often has no work for eight days out of ten. Half the shops at Jieyang’s jade-trading centre are empty. Rents have fallen by three-quarters. 3 In Beijing’s Panjiayuan market, Wang Lin sells copies of Ming and Qing dynasty carved furniture. Same story. Businesspeople used to order ten-piece suites of office furniture; he sold them as fast as his carpenters could make them, sometimes faster (there was a waiting list). Now, prices have halved and he “can shift maybe a couple of chairs out of ten”. 4 China is the world’s biggest market forluxury goods, accounting (by some measures) for half of all luxury spending.The slowdown in the growth of China’s economy and household incomes is usually seen as bad for rich-country purveyors of luxuries such as perfumes, golfclubs, art and the like. Which it is: LVMH, a producer of champagne and handbags, recently closed three shops in China, while Christie’s annual auctionof Asian 20th-century and contemporary art in Hong Kong earned only HK$508m($66m) in November, down from HK$935m in 2013. 5 But the woes of Western vanitymongers aretrifling compared with those of their Chinese counterparts. Prices of jade and Tibetan mastiffs, for example, have dropped by half or more. Hundreds of businesses have gone bust. This owes as much to politics as economics. 6 Take Tibetan mastiffs, a breed of enormous sheep-guarding dog (one is pictured above, on sale). These were the must-have status symbol for China’s new billionaires in the late 2000s. Three years ago ordinary Tibetan mastiffs could fetch around $20,000. Now they sell for a tenth of that. Earlier this year an animal-welfare group rescued 20 abandoned mastiffs from the back of a lorry, which was taking them to a slaughter house to be sold for leather and meat—for a mere $5 each. 8 Since 2013 the anti-corruption campaign ofXi Jinping, China’s president, has made conspicuous consumption politicallysuspect and reined in the practice of lavishing gifts on officials. Tea used tobe a favourite present, especially Pu’er, a fermented and aged variety from thesouth-western province of Yunnan. 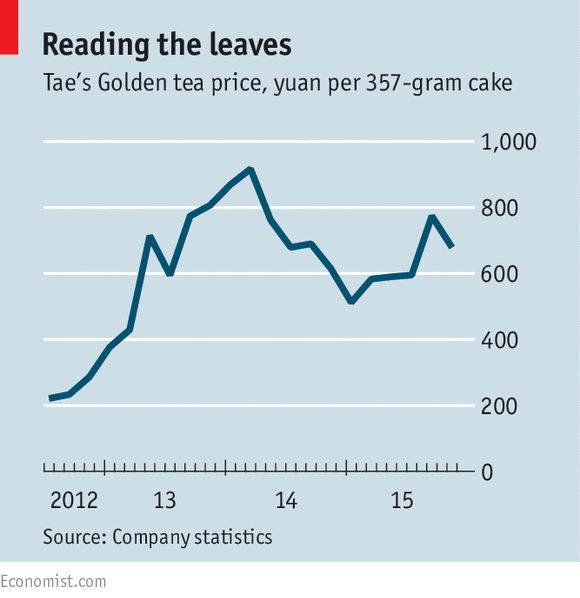 The price of top-of-the-line Golden tea fromthe Tae tea company, the world’s largest Pu’er maker, fell from 917 yuan per357 grams in March 2014 to 512 yuan, before rallying a bit (see chart). Thepresident of the Yunnan Tea Association told the Kunming Daily that, after a boom and bust, the teabusiness was entering “a new normal” (a term popularised by Mr Xi, who uses itto describe slower growth of the economy as a whole). This means lower pricesand more modest sales. 9 The abalone business shows that it is Mr Xi’s rule against “extravagant eating and drinking”, rather than a lack ofcash, that lies behind the luxury squeeze. Mr Chen, the seafood-dealer inFujian, says abalone is not especially pricey, but because it is seen as aluxury “sales took a big hit”. Of the breeders he knows, 40% quit during 2013and 2014. 10 At the top end of the mastiff business, itis not so bleak. 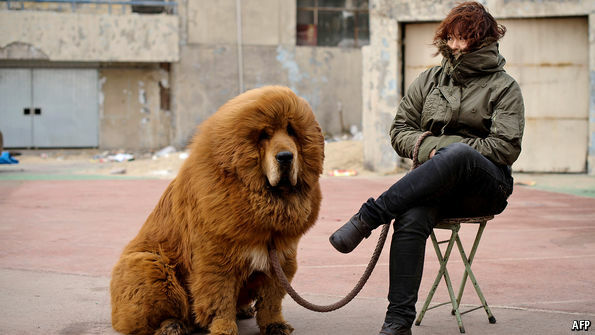 In 2011 a coal baron is said to have paid 10m yuan ($1.5m) forBig Splash, a Tibetan mastiff puppy. In 2014 a property developer paid 12m yuanfor a dog, making it the world’s most expensive canine. Han Lianming, a mastiffbreeder near Beijing, says the market for such finest-quality dogs still looksgood. “Someone offered me 20m yuan for that one. It was crazy,” he sayscontentedly, pointing to a vast ball of russet fur and teeth that is lumberingaround the courtyard (the deal did not come off). A select few millionairesappear immune to the anti-corruption campaign and unfazed by dog-breeders’efforts during the boom years to boost supply by crossbreeding. This diminishedthe rarity-value of mastiffs, but it also produced some highly sought-afterspecimens. 11 The jade market, however, has little goodnews to report. Yu Ming, the director of the jade committee of the ChinaTraditional Culture Promotion Council, a state-run body, says that though salesat big auction houses are holding up, the retail business is plummeting. In bigcities such as Beijing they have fallen by 10-20%. In second- and third-tiercities (such as provincial capitals), he says, sales are down by 40-50%. In2013 there was a spike in the price of raw jade from neighbouring Myanmar, whenpolitical violence briefly disrupted supplies. Mr Yu says many thought theconflict would lead to higher prices in China. But to everyone’s surprise theretail price actually fell. “There just isn’t that big a market any more,” helaments. CHEN BINQI grows and sells abalone, adelicious kind of mollusc, in Dongshan, a seaside resort in the southern province of Fujian. HK$508m($66m) in November, down from HK$935m in 2013. In bigcities such as Beijing they have fallen by 10-20%. In second- and third-tiercities (such as provincial capitals), he says, sales are down by 40-50%. GMT+8, 2019-4-21 04:11 , Processed in 0.050498 second(s), 26 queries .